DZero, CDF, NOvA, ArgoNeuT, E743, E629, E706, E594, E703, E663, E585, E383, E743, E629, E382, E366, E319, E311, E281 and E12. For more than 30 years, the MSU Group has specialized in Level 1, Level 2 and Level 3 trigger electronics and software; calorimetry; large-scale scintillator/phototube production; and software design for Fermilab's neutrino, DZero and CDF projects. In addition, all faculty members have been leaders, spokespersons and conveners in technical and physics groups for all of their Fermilab experiments. W-mass determination, top quark pair physics, single-top physics, QCD jet physics, searches for new phenomena, Higgs Boson searches, photon/di-photon production, W+jets physics, underlying-event studies, neutrino oscillations, multiple phenomenology collaborations and statistical analyses. WHAT SETS PARTICLE PHYSICS AT MICHIGAN STATE UNIVERSITY APART? Excellent technical staff and support, outstanding collaboration between HEP experimenters and theorists (CTEQ home), a congenial and cooperative atmosphere within the HEP group and three decades of terrific support from the department and the university. 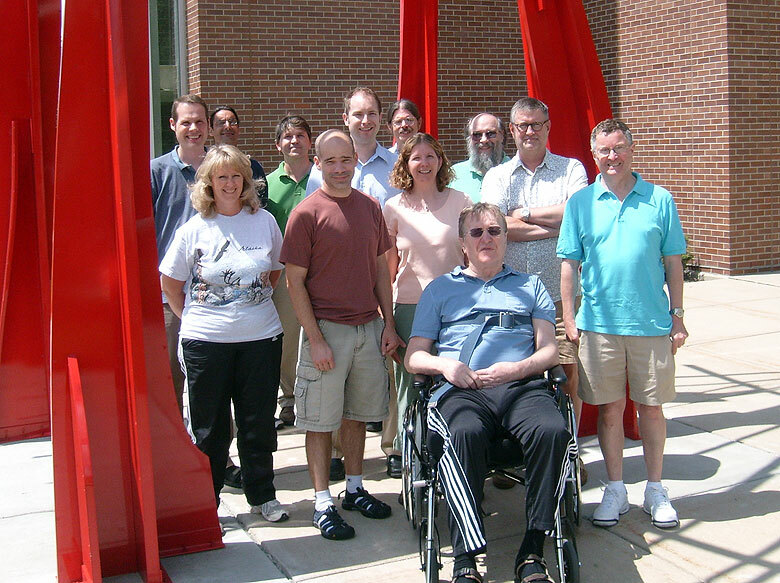 Michigan State University Experimental High Energy Physics Group: Front row from left: Brenda Wenzlick, Tom Rockwell, Kirsten Tollefson, Maris Abolins, Chip Brock and Bernard Pope. Second row from left: Reinhard Schwienhorst, Mike Nila, Philippe Laurens, Wade Fisher, Dan Edmunds and Jim Linnemann. Not pictured: Joey Huston, Carl Bromberg, Jim Kraus, Reiner Hauser, Yuri Ermoline, Pat Ryan, Sarah Heim, Alessandro di Mattia, Weigang Geng, Ron Richards, James Koll, Joel Piper, Jenny Holzbauer, Brian Martin and Patrick True.